Ancona, 28 June 2018 – CRN’s 50-metre M/Y Latona will be one of the stars at this year’s Monaco Yacht Show, to be held from 26 to 29 September. Launched in February and delivered in May, the 50-metre M/Y Latona will be on display at the international boat show in the Principality of Monaco as a worldwide première and as the utmost expression of the Italian Shipyard’s excellence and craftsmanship. 50-metre M/Y Latona is the outstanding outcome of the synergy between CRN’s Engineering Department and Interiors&Design Department with design firm Zuccon International Project. This wonderful vessel has turned the dreams of her determined and highly selective Owner into reality by drawing inspiration from the historic “SuperConero” from the 1960s. CRN’s latest jewel is a steel and aluminium displacement yacht that strikes the eye with the classical style of her outer lines and the refined details that characterise her interiors. Boasting 50 metres in length, a beam of 9.2 metres, and a gross tonnage below 500 GT, M/Y Latona impresses for the flawless balance between the exterior slender lines, the streamlined bow, the spacious interior volumes and the refined light-blue shade of the hull. Liberty style and hand-made details, selected one by one by the Owner, are the outcome of CRN’s long-standing craftsmanship and find their maximum expression in this new yacht characterised by soft, sinuous lines pervading all decks and all onboard area, resulting in a refined, harmonious ensemble. Onboard, the Owner and his guests can enjoy the utmost comfort thanks to the engineering and design solutions implemented by CRN that have by now become a distinguishing feature of many pleasure vessels in the Ancona shipyard’s fleet. In particular, the balcony that can be enjoyed even when cruising and the terrace of the master stateroom allow to maximum privacy and the closest possible contact with the sea. Aft, the exclusive tender bay – a wide indoor/outdoor living area integrated in the beach club – means that guests can spend lovely time in the lounge area, in the solarium or in the hammam, as well as in the indoor pool, which converts into a float-in garage to let the tender in. The spacious outdoor areas and the many water toys ensure pure pleasure and entertainment for the whole family. 50-metre CRN Latona is a yacht with a strong personality, built with the Owner’s vision in mind and skilfully combining functional outdoor and indoor areas with a truly unique interior design. Please find attached the press release introducing CRN 50m Latona’s international première at the Monaco Yacht Show 2018. The complete media kit with product press release and pictures will be available at the end of July. 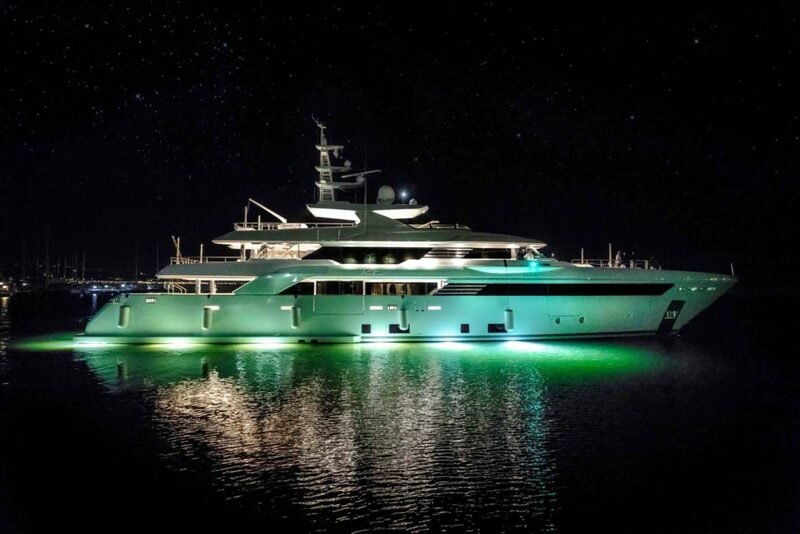 Attached there is also a picture of the yacht by night.